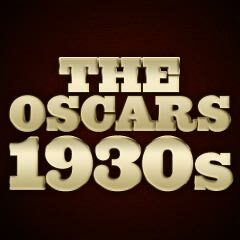 1935 was the first year that the gold statuettes were officially dubbed "Oscars." (Bette Davis insisted that she was the first to give the award its name in honor of her first husband Harmon Oscar Nelson.) This was the last year that write-ins were allowed by the Academy. (Cinematographer Hal Mohr became the first (and only) write-in nominee to win an Oscar.) And Price Waterhouse was hired to tabulate ballots for the first time this year. This year was also marked by MGM's studio campaign in press ads - the first of its kind - for one of its films, director Clarence Brown's coming-of-age comedy Ah, Wilderness! that was adapted from Eugene O'Neill's sole comedy - the effort proved unsuccessful since the film had zero nominations. And this was the first year for a new awards category, Best Dance Direction (Dave Gould won for "I've Got a Feeling You're Fooling" in Broadway Melody of 1936 and "Straw Hat" in Folies Bergere). This category would last for only three years, through 1937. Members of the Directors Guild successfully lobbied the Academy for elimination of the category, arguing that the term "direction" should only apply to the director of a film, not the dance director. 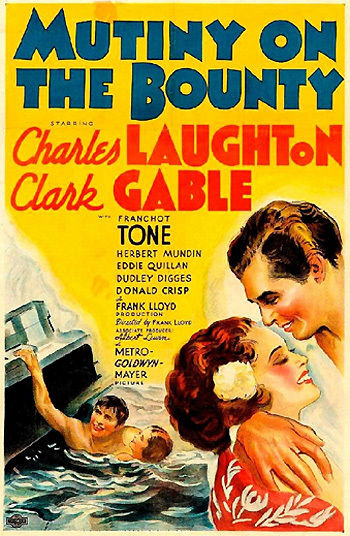 The adventure classic from director Frank Lloyd was based on Charles Nordoff's and James Hall's trilogy, and the actual historical case of the Tahiti-bound British naval vessel HMS Bounty, that suffered a famous mutiny in 1787 against its iron-fisted, sadistic commander Captain Bligh (Charles Laughton). It was an MGM showcase (the second Irving Thalberg production to win Best Picture), featuring an immortal on-screen villain, on-location shooting, and acting nominations for all its star players. And it featured the Best Actor Oscar winner from a year earlier - Clark Gable as the Bounty's mate Fletcher Christian and leader of the mutiny. director Henry Hathaway's and Paramount's The Lives of a Bengal Lancer (with seven nominations and one win, for its Assistant Directors Paul Wing and Clem Beauchamp) about three British Empire Lancers stationed in NW India who encounter a revolution against colonial rule - the category of Assistant Director was discontinued after 1937! All three Best Actor nominations lost to Victor McLaglen's greatest performance (with his first nomination and only Oscar) as Gypo Nolan in The Informer, a boasting, brawling, drunken Irish braggart known as "The Beloved Brute" who betrays his Irish Republican Army pal to the British police for a 20-pound reward. He became the second English actor to win an Oscar, following after Charles Laughton's win for The Private Life of Henry VIII (1933). [Note: McLaglen's role set the standard for many future alcoholic character honorees in the acting category. The award boosted the film's financial failings - and made it the first film to substantially benefit from an Oscar.] Dudley Nichols, the film's screenwriter, became the first winner to refuse his Oscar award on political grounds, during a union boycott that was being held during the awards ceremony. Because of a tie, there were six best actress nominees for the only time in Oscar history. To many critics, Bette Davis (with her first nomination) was compensated for her loss the previous year (as an unofficial write-in candidate) with her first Best Actress award in director Alfred E. Green's Dangerous (the film's sole nomination). Her winning role was as Joyce Heath - a self-centered, willful, alcoholic, neurotic, self-destructive ex-Broadway actress who is kept off the bottle during her comeback by an admiring young architect (Franchot Tone). Walt Disney again received a Short Subject: Cartoon award, his fourth consecutive honor in this category, for Three Orphan Kittens, and a Special Award was given to silent film director D.W. Griffith for his pioneering efforts in pre-Academy Award films ( The Birth Of A Nation (1915), Intolerance (1916), Broken Blossoms (1919), Way Down East (1920), and Orphans of the Storm (1921/22). And film legend D.W. Griffith was honored with a Special Award "for his distinguished creative achievements as director and producer and his invaluable initiative and lasting contributions to the progress of the motion-picture arts." the Marx Brothers were slighted for A Night At The Opera - many of their previous works were also neglected: Duck Soup (1933), Horsefeathers (1932), and Animal Crackers (1930) [The Marx Brothers' films were never nominated for Academy Awards (except for a single nomination for Dance Direction for the disturbingly-racist "All God's Children Got Rhythm" number from A Day At the Races (1937)). Either Hermes Pan or original choreographer-director Busby Berkeley (who never won an Academy Award) should have won the Best Dance Director Award for, respectively, "Top Hat" from Top Hat, or for two nominated numbers (the show-stopping finale of "Lullaby of Broadway" - one of the greatest dance numbers in Hollywood film history - and "The Words Are in My Heart" - with fifty-six grand pianos coming to life in an art-deco kaleidoscope) in Gold Diggers of 1935. This was Berkeley's debut film as a solo director.